We strive to do a unique mock trial with law students at San Diego Comic Fest each year. For 2018, we had our most complicated mock hearing to date in honor of the Frankenstein bicentennial. Using the events of the 1931 film as the fact pattern, law students from Golden Gate University and the University of Oregon represented Frankenstein’s Creature and Dr. Henry Frankenstein. In the 1931 film Frankenstein, Dr. Henry Frankenstein and his assistant Fritz exhume one corpse, retrieve the body of an executed prisoner, and steal an abnormal brain from a university. The amalgamation of deceased tissue was brought to life through Dr. Frankenstein’s experiments. The Creature was kept in darkness for several days and then imprisoned in a cellar. Fritz tortured the Creature with a whip and fire. The Creature killed Fritz to protect itself. Dr. Frankenstein and Dr. Waldman decided to destroy the Creature by conducting a vivisection on him while sedated. The Creature awoke while Dr. Waldman was beginning the procedure, killed him, and escaped. The Creature befriended a young girl named Maria. Both Maria and the Creature tossed flowers in a lake to watch them float. The Creature tossed Maria in the water, thinking the girl would float like one of the flowers. To the Creature’s horror, Maria drowned. Was the Creature Legally Competent to Stand Trial? Attorneys for the Creature brought a motion that the Creature was not legally competent to stand trial as a minor, because the Creature lacked sufficient present ability to consult with counsel and assist in preparing his defense with a reasonable degree of rational understanding under Cal. Welf. & Inst. Code § 709(a). The Prosecution opposed the motion, challenging the application of the standard for minors, as the Creature was nearly seven feet tall with the body of an adult. The Prosecution argued the Creature was a competent adult with competency needing to be based upon the requirements and procedures outlined in Cal. Penal Code § 1367. Was Dr. Frankenstein Criminally Responsible for the Creature’s Actions? The state charged Dr. Henry Frankenstein with contributing to the delinquency of the Creature under Cal. Penal Code § 272, due to his failure as the Monster’s legal guardian to exercise reasonable care, supervision, protection, and control over the Creature, resulting in the deaths of Little Maria, Fritz, and Dr. Waldman. Dr. Frankenstein was also charged with Murder in the Second Degree pursuant to Cal. Penal Code § 187. Attorneys for Dr. Frankenstein brought a motion to set aside the indictment under Cal. Penal Code § 995, because the charge was not found, endorsed, and presented as prescribed under the California Penal Code, because the law does not speak to contributory delinquency for reanimated human remains. Cal. Penal Code § 272 applies to children and the Monster is not a child. Moreover, there was no probable cause for charging Dr. Frankenstein for the Monster’s actions resulting in Little Maria’s death. The Prosecution opposed the motion and argued that Dr. Henry Frankenstein’s failure to exercise the reasonable care, supervision, protection, and control over the Monster, resulted in the deaths of three people. The law students did an incredible job arguing for their clients. Witness examinations were very well done. The Court ruled that the Creature was a minor, but could be tried as an adult for the death of Little Maria. However, the Creature was not legally competent to stand trial, based on expert testimony on the Creature’s ability to consult with counsel and assist in preparing his defense with a reasonable degree of rational understanding. As such, the Creature was to be sent to a mental health facility for treatment. Dr. Frankenstein presented the issue of someone whose conduct was morally reprehensible, but not legally responsible for the deaths caused by the Creature. However, there were grounds for Dr. Frankenstein to be tried for contributing to the delinquency of a minor. Moreover, the Court recommended the State add the charge of attempted murder of the Creature with Dr. Waldman against Dr. Henry Frankenstein. The audio from the mock hearing, including the question and answer session, is available on our podcast channel. I was invited as a late addition to the Kaiju panel moderated by Beth Accomando, KPBS Cinema Junkie. 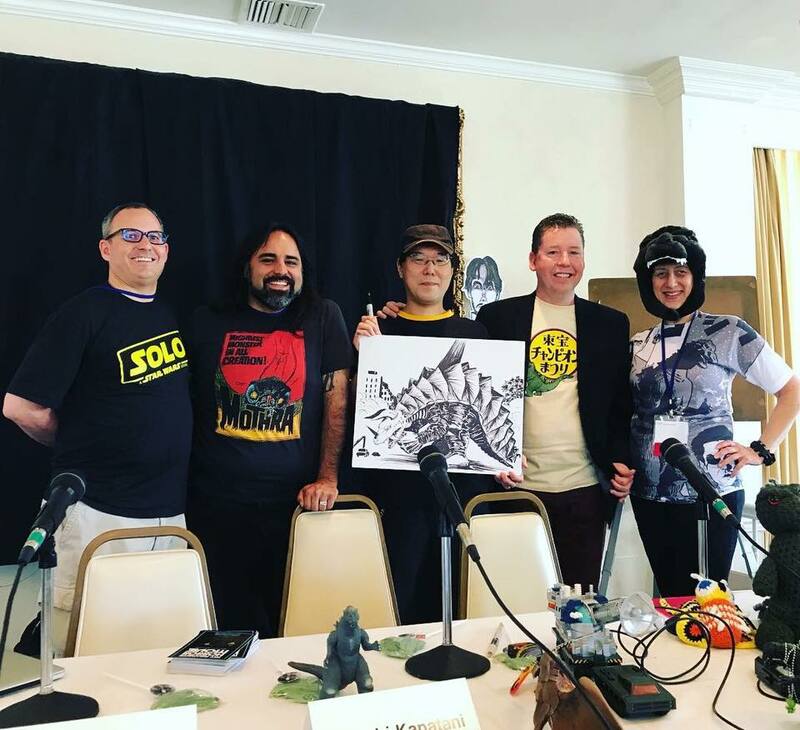 It was a lot of fun to geek out with Miguel Rodriguez of the Horrible Imaginings Film Festival; artist Hiroshi Kanantani of Monster Attack Team, and Edward L. Holland, editor in chief of Monster Attack Team. We had a rip-roaring good time sharing our knowledge of Kaiju movie history, themes, and thoughts on Godzilla, Gamera, Mothra, and more.